Thursday’s game at the Scotiabank Saddledome was a significant one for both the Arizona Coyotes and the Calgary Flames. 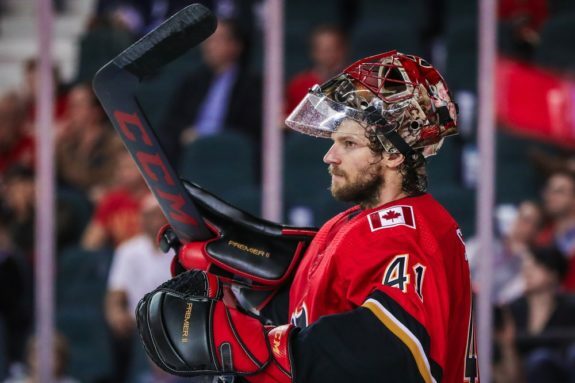 It marked the first matchup between the two Pacific Division opponents since the Coyotes traded long-time goaltender Mike Smith to the Flames on June 17. It’s a game that the 35-year-old goaltender likely had circled on his calendar since arriving in the Stampede City over the summer, and many were curious to see how both Smith and the ‘Yotes would perform when they met on Nov. 30 after an unceremonious split over the offseason. After quite a bit of hype prior to puck drop, it was Smith who had the last laugh on Thursday – he stopped all 28 Coyotes shots he faced and handed Arizona their first shutout loss of the year. The loss also dropped Arizona to 6-18-4 on the season. Smith publicly stated that he doesn’t enjoy seeing his former teammates struggle, which is understandable considering the strong relationships that players, and especially teammates, in the NHL share among one another. However, when it comes to Arizona’s front office and ownership group, I’m sure the former Coyote doesn’t mind seeing Arizona struggle one bit – the Coyotes thought they could do better than Smith at the goaltending position, but they currently sit at the bottom of the league in both points and goals against through 28 games. Smith was a busy man early on in the game on Thursday – the Coyotes peppered him with 16 shots in the opening period, but Smith stood tall and stopped everything he faced. The 16 shots on goal were the most the ‘Yotes have generated in a single period this year, so it had to be frustrating to see Smith stop every puck thrown his way during one of Arizona’s best periods of the season. Indeed, the Coyotes appeared affected by Smith’s first-period dominance, as they struggled badly in the second period – they were outshot 13-5 during the middle frame and allowed the Flames to score first, as Mark Jankowski put Calgary in the driver’s seat with his fourth goal of the season at 2:48. Calgary continued to dominate the play in the third period and came away with a 3-0 victory after outshooting Arizona 17-7 in the final frame. After spending six seasons in Arizona as the starting goaltender of the Coyotes, Smith’s tenure in the desert came to a rather unceremonious end over the summer. Following years of criticism from the fanbase, who believed that Smith had largely failed to live up to the mammoth six-year, $34 million contract he received after the lockout-shortened 2012-13 campaign, the Coyotes made the decision to send their veteran netminder to Calgary over the offseason. The move felt like a salary dump at the time – the ‘Yotes retained 25% of Smith’s salary and received only a collegiate defenseman and a conditional 2019 third-round selection in return. Goaltender Chad Johnson was also sent to Arizona in the trade, but he was included solely for Expansion Draft compliance purposes – he was a pending free agent at the time of the deal, and signed with the Buffalo Sabres when free agency began on July 1. Perhaps feeling slighted by the fact that the Coyotes gave him away to a Pacific Division rival for practically nothing in return, Smith was at the top of his game on Thursday night against his former club. The Flames didn’t allow the Coyotes many scoring chances throughout the game, but Smith was rock-solid on the chances that Arizona did manage to generate and easily earned his 35th career shutout. Lost in Smith’s shutout over his former teammates was the performance of Coyotes’ netminder Scott Wedgewood. 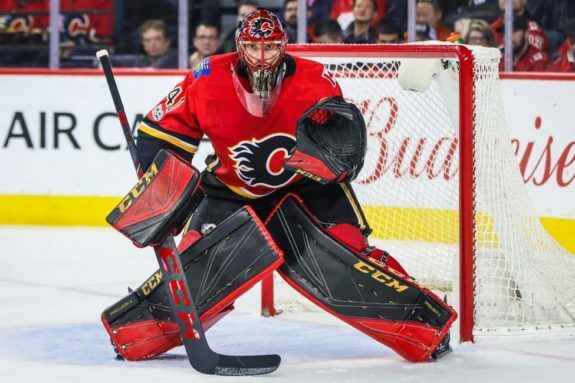 The 25-year-old rookie goaltender was peppered with 44 shots on Thursday at the Saddledome, but he kept the Coyotes in the game until late in the third period when Calgary struck for two quick goals to put the game on ice. After a solid opening period in which they generated 16 shots on net, the Coyotes were outshot 30-12 over the game’s final 40 minutes. They gave up multiple Grade-A chances throughout the contest and likely would have been embarrassed by a five or six-goal margin had it not been for the performance of Wedgewood. There were questions about Wedgewood’s job security after a second-period meltdown against the Vegas Golden Knights on Nov. 25 (and a near-comeback with Marek Langhamer in net), but he’s more than made up for it with his performances over his last two starts. Wedgewood nearly backstopped the Coyotes to their fourth consecutive road victory on Tuesday in Edmonton and was stellar again on Thursday in Calgary. If he can continue to play well in Antti Raanta’s absence, the Coyotes will continue to have chances to win night in and night out.